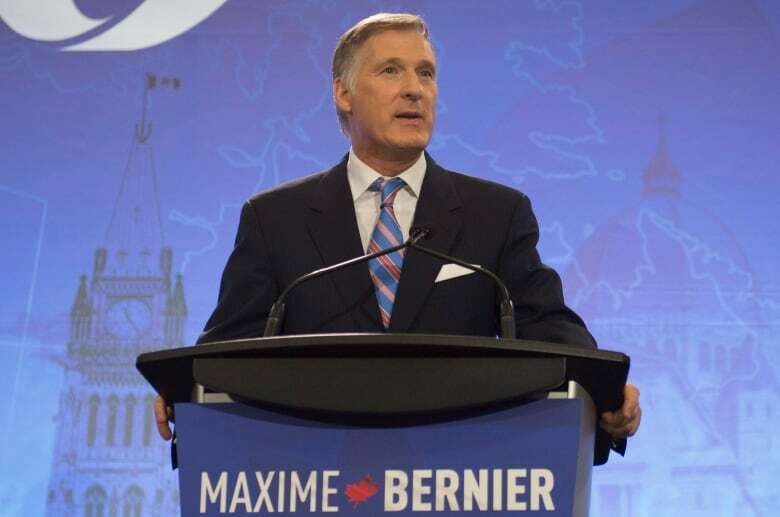 The third debate of the Conservative leadership campaign held in Quebec City on Tuesday, the only official debate to be held entirely in French, featured some sharp exchanges between candidates, with much of the fire being directed at Quebec MP Maxime Bernier. The debate also proved to be a serious challenge to the French-language skills of some of the 13 contestants taking part. The crowd was clearly partial to the two local candidates — the loudest applause came when Bernier and Steven Blaney were introduced, while polite applause greeted the 11 other non-Quebec contestants. 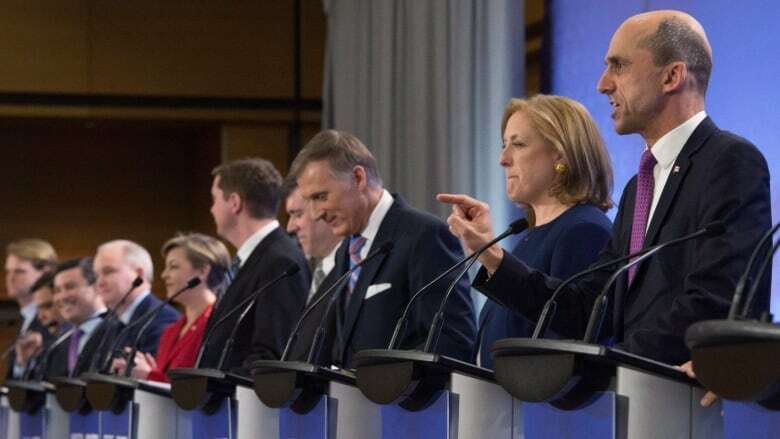 A link with Quebecers was a common theme of the debate, with candidates emphasizing the importance of the French language and their individual connections with Quebec. Michael Chong, who had resigned from Stephen Harper's cabinet in 2006 over the Conservative government's Quebec nation motion, promised to "defend the French fact in North America," while Kellie Leitch said she was taking French-language classes and hoped to improve. The debate was also the candidates' last opportunity to make their mark with party members before the entry into the race of Kevin O'Leary, which CBC News has learned will happen on Wednesday. O'Leary's name did not come up until after the debate, however, when his absence was criticized by some of the candidates, most angrily by Lisa Raitt. Earlier this month, leadership rival Andrew Scheer had called for O'Leary to get into the race before the French-language debate. But O'Leary, who speaks little French, recently put out a statement saying that "out of respect for Quebec and French-Canadians, I feel it makes more sense to abstain from the French debate until I am more proficient." Though a few of the Conservative leadership candidates are fluently bilingual, about half of the anglophone contestants who participated in the previous bilingual debate in Moncton in December struggled in their second language. Those struggles continued in Quebec City. Bernier and Blaney stood out from their rivals during the debate, taking full advantage of their fluency in French. Chris Alexander, Rick Peterson and Pierre Lemieux also spoke comfortably throughout the night, while Chong, Scheer and Andrew Saxton had little trouble being understood. But other candidates had greater difficulties. Deepak Obhrai was nearly incomprehensible, reading notes phonetically and once admitting that his pronunciation was "horrible." Leitch, Brad Trost, and Erin O'Toole also stumbled. Raitt relied primarily on notes, but seemed to have improved her French somewhat since the December debate in Moncton, N.B., though she struggled in the post-debate scrums with reporters. Many of the candidates used their 30-second rebuttals early, with Leitch and Blaney both going after Bernier for his position on ending corporate welfare, something they argued Bernier had given out when he was a cabinet minister. Leitch called Bernier a "liar and an impostor." Both Blaney and Lemieux also went after Bernier on his pledge to end supply management. Bernier riposted by saying supply management was defended by a powerful interest group, but that he was looking out for the interests of Canadians. O'Toole then deplored the attacks happening among Conservatives — as he has already done in this campaign — a position that was seconded by Chong. Supply management re-emerged as a topic of controversy when a question about it was posed to every contestant. Though Bernier was alone in arguing for the end of supply management, Blaney used the opportunity to attack Scheer, saying that the Saskatchewan MP had not defended supply management in the past. Scheer called Blaney "dishonest" and said that he had voted to protect supply management in the House of Commons. A few of the questions in the debate touched on immigration and national security. Trost suggested that all immigration from "pro-radical Islam" regions should be halted, while Leitch spoke again of her plan to impose screening of immigrants for "Canadian values." Some of the candidates also defended the law brought in under the Conservatives giving the government the power to remove Canadian citizenship from dual citizenship holders found guilty of terrorism. Obhrai was not a defender of the law, saying that "a Canadian is a Canadian is a Canadian." In response, Blaney, the former minister for public safety, said that he supported this law and that a "terrorist found guilty is a terrorist is a terrorist." The candidates were asked what they would do to help Indigenous Canadians. Chong proposed investing in education while Blaney suggested that the reserve system should be dismantled, a proposal that was dismissed by Chris Alexander and Rick Peterson. Bernier suggested that the federal government should respect treaties and ensure that Indigenous Canadians have access to resources that give them equal services to other Canadians, but that they also have responsibility for their own destiny and that the government "can't always send billions to solve problems." The debate was moderated by Pascale Déry, a former journalist and news anchor who ran unsuccessfully under the Conservative banner in the last election. The fourth debate is scheduled for Feb. 28 in Edmonton. The winner of the Conservative leadership vote will be announced on May 27. Conservative leadership contenders spend more time agreeing than debating in Moncton, N.B.